By default SQL Server ERRORLOG is stored in "C:\Program Files\Microsoft SQL Server\InstanceFolder\MSSQL\Log" folder. The ERRORLOG location is configured as a startup parameter for SQL Server Service. To change the location of ERRORLOG you need to modify the startup parameter -e.
Replace "-eC:\Program Files\Microsoft SQL Server\MSSQL11.SQL2012\MSSQL\Log\ERRORLOG"
Restart SQL Server Service to apply changes. The ERRORLOG will be created to "C:\Logs" after SQL Server is restarted. 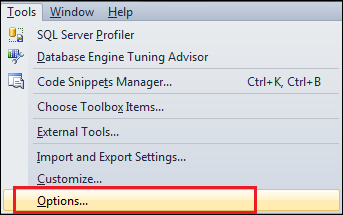 Location for SQL Server Agent Log can be changed using T-SQL or SQL Server Management Studio. 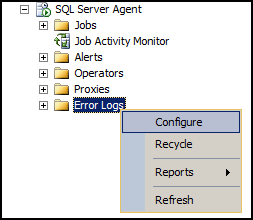 Method 1: To change SQL Server Agent Log location right click on "Error Logs" node and select "Configure"
Click on "OK" and restart SQL Server Agent to apply changes. 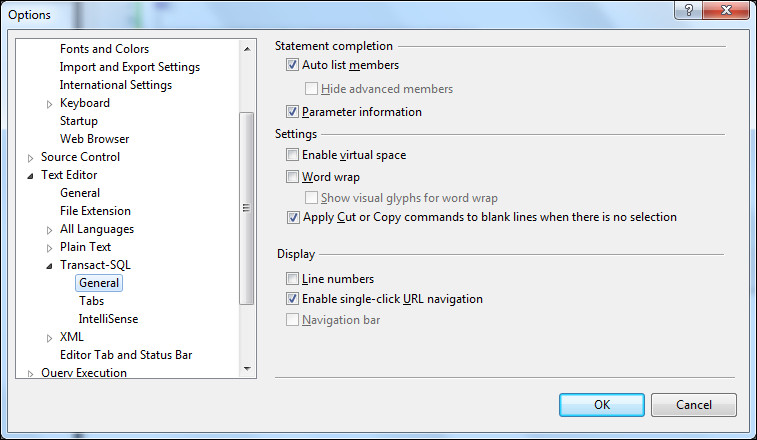 Execute this code and restart SQL Server agent to apply changes. If you have lost the password for sa account or does not have any administrative account and you are locked out of SQL Server you can still login to SQL Server as an Administrator using Local administrator account. You can use any account which is part of local Administrators group. 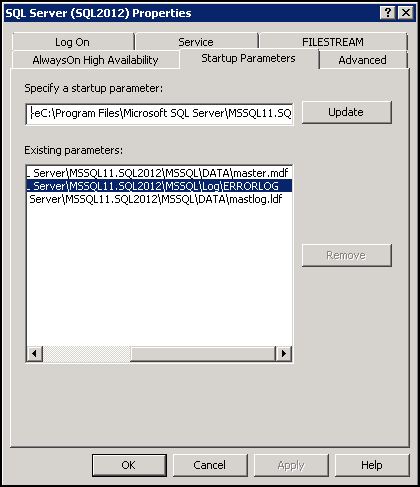 To be able to login using local admin account you need to stop and start SQL Server in single user mode. Using below method you can restore access to your server by resetting forgotten administrator password or by creating a new Administrative account in SQL Server. Now you can login to SQL Server using the newly created Administrator account.